Project 7, Making leather impression stamps with 3D printing. This project page supersedes Project 1, as this will now be my preferred method to produce leather impression stamps for complex logos. The Project 1 page was created many years ago when I documented how I made up leather impression stamps for restoring camera coverings. The Ihagee Parvola pictured here arrived in May 2018 and was in terrible condition. The camera was water damaged, the leather had relaxed and the Ihagee logos were all but lost. 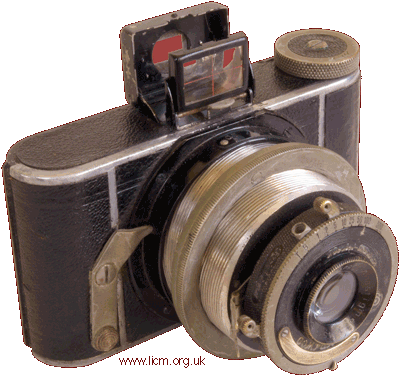 Additionally, someone had painted the leather gloss black to give the camera some shine back. I decided the leather would be replaced, which would entail making up new logo stamps. This shows the camera in the state it was on arrival. 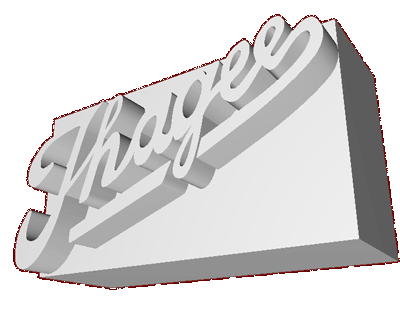 This lead me to thinking about how the original process could be improved, as carving out the Ihagee logo in plaster of paris looked to be a challenge too far. The idea of using digital 3D printing seemed to be an avenue to pursue, so I did a quick bit of internet research and found many companies offering 3D printing services. The first problem was the complete lack of a visible logo, particularly on the rounded front face next to the catch, this was completely obliterated. CJ at www.cjs-classic-cameras.co.uk very kindly took the time to make a pencil rubbing of his Parvola's logo, took a photograph and sent it to me. This is all I needed, just a pattern to work with, something that can be traced. This part of the process is fairly flexible. I chose to trace the image digitally with an Adobe Photoshop path, then import that to Adobe Illustrator to produce the image at left. This gave me control over the finished object, and I am lucky with both the experience and the software to hand. However, many 3D printing companies would have happily accepted the picture of the rubbing and created their own model from that. I found a local company were very happy to take my illustrator file and convert it to a 3D model for £5. Adobe Illustrator can actually produce .dxf files suitable for 3D printers, but in practice it's probably best to leave the creation of the 3D model to the printer. I did try it, but it left a number of voids, which the printer would have needed to spend time fixing anyway. I used printedbournemouth.co.uk, they quickly understood how I needed the file converted and rapidly produced the 3D model at left. This was the initial version with the letter form 3mm proud and the base 10mm deep. However we later revised this to a letter form 2mm proud and the base 5mm deep. 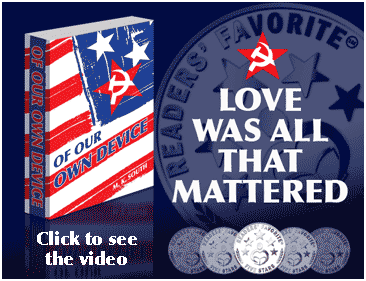 If you click the image at left you can download the 3D model. Just for the joy of it, you can open this page https://www.viewstl.com/ and then drag the downloaded 3D model onto the page. 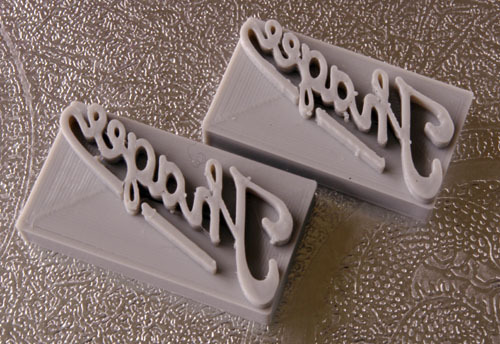 The 3D model needs to be reversed for the stamp to produce the correct reading impression. 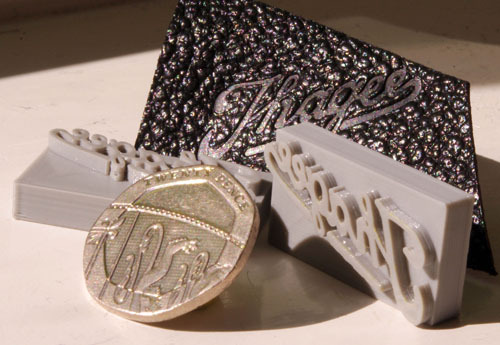 The material used was 0.2mm nylon filament, as it has excellent strength in compression and our tests confirmed the stamp would withstand many times the pressure required to make a good impression. The life of the stamp is limitless for our purposes. The other benefit is that the material is easy to shave off any crumbs from the imaging process with a small scalpel. The small bobbles sometimes left behind, are called 'crumbs", you can see several on the raw stamps at left. 3D printing is perfect for this application. Although the filament would appear too coarse at 0.2mm, this really only matters in the vertical plane. The horizontal resolution is dictated by the smoothness of the printer step motors, and this is the plane we are interested in. 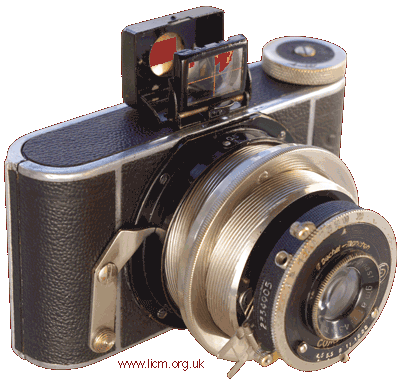 For this camera two logos were required, one at 28mm the other 30mm long, the same file can produce both. To prepare the stamps a quick sanding with coarse aluminium oxide paper, finished off with fine wet and dry was used to give the faces a nice flat finish. Any imperfections will be recorded in the impression, including coarse sandpaper scratches. The impression technique remains as usual, damp the back of the leather until it begins to weep under light pressure, then place the stamp in compression on the front (it doesn't need that much) and let the panel dry out to produce a permanent and very crisp impression. 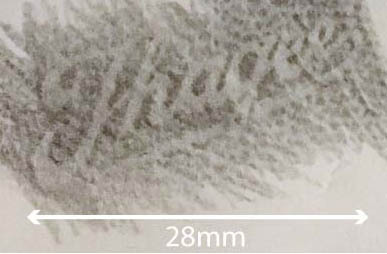 This image shows the scale of the impression stamps and the first test impression behind. The leather sample in this case is a small piece of Morocco pattern, which is too coarse for the Ihagee Parvola, but was only serving as a guide to the suitability. The final pattern used was "Hard Grain", as ever supplied by Hewit of Edinburgh. Thanks go out to Lancefield Conservation, specialist book and document restorers who let me go through their leather samples to get a good match. So after the camera was overhauled, cleaned and repaired, the new leather panels were made with their blind logo impressions and rules put in with a hot tool. Then applied to finish it all off. The requirement was to undo the water damage, return functionality and retain some of the patina from use. The Ihagee Parvola is an interesting camera, worthy of saving and this example is now fit for display and in full working order once again. You can see the camera here in all it's 360 degree glory, including the embossed leather on the front and back using the 360 view link below.